Well April is nearly over and I haven't finished my month's project yet, of 6mm Teutonic Knights. Hopefully I shall get them finished this week, as I have a couple of days away with work and so will be packing my travelling paint kit. I did however manage to get some photos taken. 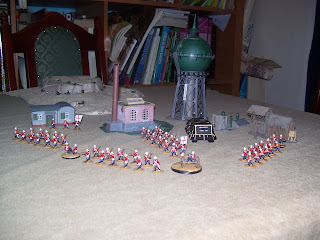 Below is the painted 15mm British Colonial Troops from February, complete with my latest purchases. I went into the local model/railway shop and they had alot of second hand buildings, several of which I thought would suit a 15mm VSF game. Altogether they came to just over a tenner. This weekend I can't see me being too frugal as I shall be attending Triples on the Saturday, with a shopping list of things to buy. As next month we are painting 15mm Sci-Fi, I feel I shall have to visit Ground Zero Games and buy some of their new figures, the NAC and Alien Mercenaries. 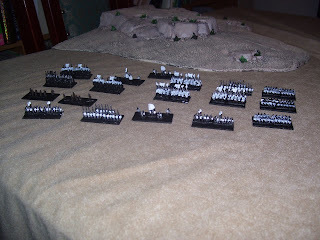 I also have a few more 6mm figures I need from Irregular to complete my Brethren Army. As I said next month is 15mm Sci-Fi, so come May we will be trying a variety of rules. On the list at the moment are Stargrunt II, Beamstrike and Laserburn/Imperial Commander, I'm sure more will be added as the month progresses. The thank looks good, but I reckon that your British have me completely outgunned now. I pity my poor Martians.